When preparing for a baby you need your body to be in optimal health. Regardless of your current health circumstances, we can help. The major difference here is that we assess the complete body to homeostasis and don’t just look at the reproductive organs. Quite often the underlying issue can stem from someplace completely different like the gut or the heart for example. On doing a full assessment, which takes a few minutes and is completely non-invasive, we get a full clear picture of your health situation and can then do up a complete inhouse treatment plan including everything from your diet and lifestyle to your treatments needed to your supplements needed. Ultimately when it comes to your fertility, you need to optimise your health. The initial assessment is with leading edge medical technologies that assesses every aspect of your physical health. This is important because the human organism is very complex with so many different things going on at once, we need to look at how things are in correlation with one another. Quite often it shows that your reproductive organs are good but there is another imbalance or dysfunction in the body that is influencing the reproductive organs and interfering with fertility. Once we know what is the cause then we can do up an inhouse treatment plan for you. We use two different technologies to get a full picture. The first technology is made up of 7 different modalities to simultaneously test many different aspects of the human body. It is a gold standard device with high sensitivity and high specificity. 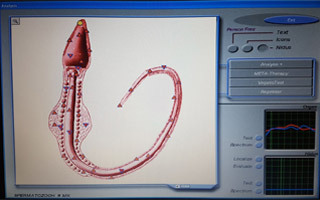 It connects the dots together because of the number of different modalities to pinpoint the cause using so many different parameters. This device is able to measure homeostasis. Heart Rate Variability measuring how the ANS (Autonomic Nervous System) is regulating the heart. We can calculate how ANS is regulating other factors in the body like stress responses, abnormal digestive reactions etc. Another modality is Digital Pulse Wave Analysis measuring vascular parameters like how much time it takes the blood to travel through different parts of the body, stiffness of the arteries, the force in each heart beat ..
Oximeter test measuring various oxygen levels with a patisiograph on the finger. Bio Impedence Test measuring body composition. Different fields are absorbed by different muscles which can calculate body composition from fat percentage, fluid – inside and outside cells. Also a different bio impedence test called Phase Angle test which is testing the integrity of the cell membranes and basically testing how cells can exchange ions. We also have a test, Electro Interstitial Scan Test which can test the cellular activity in different areas of the body. A little bit of the science behind the 7 modalities. The analyses the body through the interstitial fluid. There is 4 times more interstitial fluid than blood in the body. 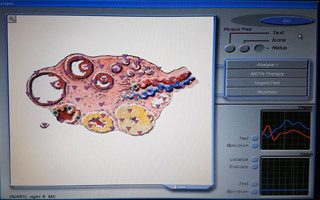 Blood transports information about the different cells whereas the interstitial fluid surrounds the cells so when we do and EIS analysis it’s different to a blood test in that we can analyse the cells in their working environment. This gives us a high sensitivity and high specificity to the results. The device sends a current, not enough to feel or to be invasive but enough to travel through interstitial fluid (salt water is very conductive) but it won’t penetrate the cell membrane. It tests 22 volumes of the body to look at different factors in the body. We can see in real time what is exchanging within the cells. Exchange over the cell membranes. EIS also evaluates ANS (Autonomic Nervous System). Combined, we can see a bigger picture. This is measuring out in the limbs and not on the heart. This shows us how circulation is functioning. Contraction of the heart. We need so many different testing modalities to map out what is symptoms (what is compensating) and why is it compensating and what I the root cause. Here the device sends in a field, looking what charge breaks the cell membrane. This looks at body composition – bmi, fat, water. It is very accurate with a high sensitivity and a high specificity. After this health screening we use a second device to further analyse the body. This device has a large database of hundreds of thousands of tissue samples and microorganisms tested with molecular spectroscopy. It measures molecular movement, compares your results to the reference database to see if there is a match. It does more but this is the main part. There are hundreds of millions of processes going on in the human body at a time. Everything is monitored and counter measures are triggered by the brain. The brain monitors everything and we measure everything remotely at the level of the brain stem. There is 99.9% accuracy. The brain can monitor because we have an internal cell communication and we scan that. The same way as you can scan a wifi or mobile phone, we scan the carrier wave, just the same way all wireless communication works. We are connecting and reading the information externally and non intrusively. Cells have molecules, molecules have molecular movement. Any physical change causes change to the molecular movement. This test is very accurate because it doesn’t interfere. Mm communication, high gHz range, billions of cycles per second. So basically it works like a radio tuning in but we tune in to a whole range of stations at once to the vibrations of the cell membrane. There is a low level laser pointing at the skin on the forehead. This goes through the skin to tissue and activates the whole process. Each assessment takes about 90 minutes and during this time you will see all of the results in live time and we talk through them thoroughly together. You don’t eat for 2 hours before. This is a once off test but we do retests along the treatment plan to show you your improvement and to see where still needs work. The results include 3d images of your organs, relaying organ function. Information on your hormones and glands. We test you for toxicity and check that your nutritional needs are met. Check for inflammation and oxygenation of tissues. Here is a more medical description of what I have said above if you prefer to know more details. The core of our concept is assessment to find out what’s not functioning correctly and then to find out why. Health problems are usually caused by a combination of factors and cannot be completely fixed unless this combination of causative factors are found and eliminated/solved. For this we have 2 assessment devices which combines a total of 8 methodologies. The first technology we use in all clinics is a device that combines 7 medical technologies for functional testing of important health factors. It combines enough parameters to map the homeostasis. Testing how the human organism’s foundational processes are functioning is an important starting-point to solve health problems, as we can then find out what needs to be tested further with other methodologies for causative relations. The test also gives important information on which lifestyle changes are most necessary to prevent health-problems and provide better balance, and functional self-regulating mechanisms. Furthermore the device provides an opportunity to track the effects of the therapy, and changes are even displayed with graphs from each test performed on a client. It is FDA registered as a medical device. Anything that comes up can either by treated by lifestyle changes (if they are simply imbalances) or, if the body isn’t functioning in an area and self-healing couldn’t take care of it, we find the problems that are creating the dysfunction and then treat them with the technologies, no drugs needed. We do a complete mapping of cellular level and work to bring about homeostasis. You conceive naturally. The test itself only takes a couple of minutes and is completely non-invasive. You are fully clothed except for your bare feet. Electrodes are placed on your forehead but you don’t feel anything. Your hands and feet are placed on metal plates connected to the computer. The computer then analyses the data for your therapist to interpret. Along with the assessment we use another technology to look deeper into each organ at a cellular level, this is a quantum medical NLS analysis for finding cellular strain level, microorganisms, mercury toxicity and many other factors on a cellular level. It can scan each organ with a method similar to a molecular spectroscope and compare the results to a huge reference database. There is no need for tissue samples from the patient, as this technology can test everything in a non-invasive way at the level of the brain stem. It also features a reprogramming therapy, giving the brain the blueprint for how the molecular movement and cell information should be. Full mot using 2 different digital technologies to get a complete view of the body and how any imbalances and dysfunctions are affecting the whole body and your health. We can also treat what comes up and offer diet and lifestyle advice to prevent triggers during the treatment.